Tahini paste is made from ground sesame seeds and is crucial for making dishes like hummus, baba ghanoush and halvah, a sweet treat that was always on our dessert table for holidays when I was growing up right alongside the cannoli. 2 tablespoons of olive oil to 1/2 cup depending on how thick or thin I want it. Lightly toast the sesame seeds over low heat about ten minutes, stirring often, don’t worry about getting a lot of color on them, like you would if toasting nuts. They’re fragile and burn easily, so watch them carefully. Allow to cool off and then add them to the bowl of a food processor along with a 2 tablespoons of oil to start. You can also use a mortar and pestle. Pulse until a paste forms, scraping down sides as needed and adding more olive oil to reach a consistency you like. The homemade tahini will have a rougher texture than store-bought and may even be stronger in flavor. The reason being is the store-bought version uses hulled sesame seeds making for a smoother tahini. 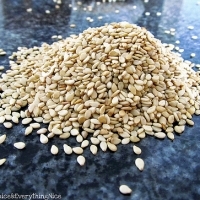 If you can, buy sesame seeds that are not hulled as they are more nutritious. Thank you for posting this. I live waaaay out in the boonies 1/2 of the year and don't have quick access to items like this.